It doesn't take an expert to realize that Julian Edelman is Tom Brady's safety blanket on the field. 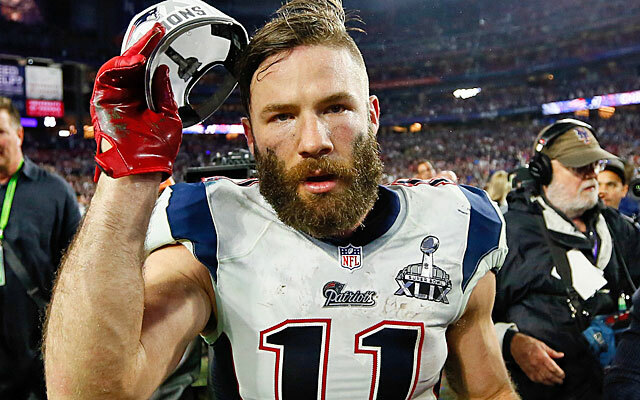 Whenever the team desperately needs a conversion, it seems like it's Edelman coming up with the play every time - most notably in last year's Super Bowl. Ever wondered how Tom Brady and Julian Edelman connect so well on the field? Apparently it all started with a Jenga game in Montana. 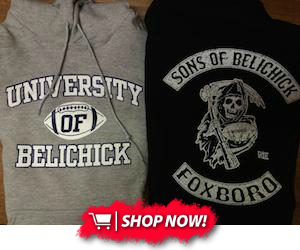 Apparently someone in the NFL beleives its a sure thing that Brady's suspension will be enforced, and soon. Take that for whatever its worth. Craig Carton, the co-host of Boomer and Carton on WFAN, said Friday that he was with a "very influential person in the NFL" on Thursday, and that the person told him "there's no doubt in his mind" that Brady will in fact serve a four-game suspension this season after the NFL's appeal is heard. This one really made the rounds today and was pretty quickly dismissed by nearly everyone. The typical appeals process, apparently, typically takes 10 months. If expedited it could take half that. League response to WFAN report on Brady appeal: "It is highly unlikely that the appeal will be decided before the end of the season." The report came in before the NFL had filed an appeal, which they did late in the day today. More to come, but I would not expect Tom Brady to be suspended this year. Don't worry. Dion Lewis better than Shane Vereen? According to ProFootballFocus, Dion Lewis may be better than the runningback he replaced. Indy based columnist Greg Doye has written some pretty scathing things about Tom Brady and the Patriots since Spygate. First he said their Super Bowl victory should be vacated. Then he comapred Deflategate to rigging a game. Even if you think the Pats are guilty, saying its equivalent to rigging a game is a complete misunderstanding of what the crime even was! Anyway, his latest idea is that a Patriots fan slashed his tires. Seeing as he seems like such a rational fellow, I'm sure there would be no one else pissed off at him enough to slash his tires. Must've been a Pats fan. Through two weeks, the Patriots are the only team in the NFL tied for the league lead in red zone points (55), touchdowns (seven) and scores (nine). They’ve got the unGronkable force to thank for much of that success, as tight end Rob Gronkowski’s 46 red zone touchdowns since 2010 are the third most in the league, the most among non-running backs. Wendell has been on the shelf since the start of the season, has now missed the last four practices with what the team has called an illness. Wendell also missed practice last Friday before the Bills game and was limited on Wednesday and Thursday leading up to the game in Buffalo. Cornerback Darrelle Revis, wide receiver Eric Decker and running back Chris Ivory are all uncertain to play Sunday because of injuries. Revis strained his groin Monday night during a game in which he had an interception and two fumble recoveries in the Jets' win at Indianapolis. He practiced on a limited basis Thursday after not participating at all Wednesday. Mike Reiss has a great story about Belichick's pop quizzing. It's definitely worth the read. Check out Alan Branch's thoughts on it all. "It's nerve-wracking and crazy having the head man up there. You know your stuff, but it's kind of like being quizzed in high school; you don't want to be called out and get something wrong and they're going to think you're not studying," he said. "You're looking at him, waiting to see who he is calling, and kind of hoping it's not you, but going over the answers in your head when the other person is called. "This is the only team I've ever had to do that with," he continued. "When I first got here, I didn't know what they were expecting. There was a crazy question about favorite food or something. Just seeing that when you first get here, you realize what kind of gig this is. You have to make sure you're studied up on your opponent. They have a certain expectation here to uphold, and maybe that's the reason we do so well here, because we know our opponent really well compared to other teams I've been on." Aaron Dobson quietly had a nice game against the Bills. One reddit user put together some highlights. Trouble in paradise! This was the big news of the week. Bleacher Report’s Mike Freeman reports that All-Pro tight end Jimmy Graham is p—ed off and hates what’s happening in Seattle. Freeman says he’s been apprised of Graham’s attitude by players in the locker room. Graham reportedly is questioning why the Seahawks traded for him based on the ways they’ve used him. The New England Patriots sacked Buffalo Bills quarterback Tyrod Taylor eight times for a loss of 53 yards in Week 2. Taylor also hurt the Patriots on the ground, however, rushing for 43 yards and one touchdown on five carries. Gary Myers of the NewYork Daily News has a new book coming out that dives deep into the Brady-Belichick relationship. Check out the whole excerpt at the link, but apparently, it's a relationship that's purely business. Surely in all their years together, Brady has been exposed to that side of his coach. “Me? Very rarely, very rarely,” he said. Former NFL wide receiver Nate Burleson compared the current group of Patriots standouts to Michael Jordan’s Chicago Bulls squads during a recent NFL Network segment. According to him, Gronk was this team’s MJ.